Blues backup goalie Brian Elliott was at his best early (five saves in the first period) and late (six stops in the third period and one in overtime) in Sunday's win over the Wild. 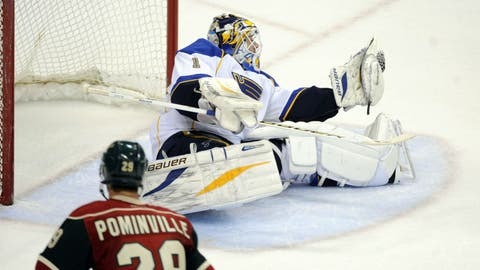 The St. Louis Blues are now the top team in the NHL following Sunday’s 3-2 shootout win in Minnesota. "It feels good," T.J. Oshie told FOX Sports Midwest’s Bernie Federko on the "Blues Live" postgame show. "We have to keep her going through and hopefully we stay there the rest of the year." This one wouldn’t win a beauty contest, but the Blues will gladly take the two points considering it was their second game in as many nights, their sixth road game in seven contests since the Olympic break, they coughed up an early two-goal lead and they had backup Brian Elliott in net. It was the fifth consecutive win for St. Louis (44-14-6, 94 points in 64 games) and their seventh victory in nine games. The Blues’ only losses during that stretch were their back-to-back, 1-0 setbacks at Vancouver and Anaheim in their first action after the Olympics. St. Louis surpassed Anaheim (93 points in 64 games) with its two points on Sunday night and is now four points ahead of Chicago — with one game in hand — for the top spot in the Central Division. The Blues now have 18 games remaining in the regular season, including 10 at Scottrade Center. Among the eight road games left are two in Chicago. Before Sunday, Elliott’s last game action came with his start in Anaheim on the night that Jaroslav Halak was traded for Ryan Miller. He faced only 19 shots over 65 minutes Sunday, but he stopped 17 of them. He was at his best early (five saves in the first period) and late (six stops in the third period and one in overtime). "I think without Ells making some big saves in there, we don’t go into overtime," Oshie told Federko. Elliott made a highlight-reel-worthy save against Mikael Granlund early in the third period to keep the score tied at 2-2 and had a nifty toe save versus Zach Parise to open the shootout, which was quickly followed by a goal from shootout wizard T.J. Oshie. The goalie has now won three of his last four starts — he has stopped 91 of 100 shots on goal during that stretch — and is 6-0-0 in his career against the Wild. The Blues’ penalty kill was successful on three Wild chances Sunday, the third straight game without a power-play goal allowed. Have a topic that is important to you? Share it with me on our FOX Sports Midwest Girls social media pages (Facebook: FOX Sports Midwest Girls; Twitter and Instagram: @FSMidwestGirls). St. Louis has killed 88.7 percent of opponents’ power-play opportunities this season, the best mark in the NHL. Since the Olympic break the Blues have killed 23 of 24 power-play attempts. Defensemen Alex Pietrangelo and Jay Bouwmeester and forwards David Backes and Alexander Steen were on the ice for a majority of the Wild’s 6 minutes on the power play. Minnesota managed just one shot on goal on the power play, and that was in overtime during a four-on-three advantage. Defenseman Carlo Colaiacovo, playing in his first game since March 2, made two key plays in the first period. Colaiacovo scored the Blues’ second goal of the night on a wrister from the slot with the help of assists from Jaden Schwartz and Vladimir Tarasenko. It was his first goal of the season and his first in 43 games — dating to Feb. 11, 2012, when he scored the winner in the Blues’ 3-2 overtime victory against the Avalanche at Scottrade Center. He has lit the lamp 31 times in 390 career games. The veteran D-man also made a key defensive play late in the first period when he was able to use his stick to disrupt Nino Niederreiter’s breakaway attempt, which ended with a clutch save by Elliott.